The Internet has revolutionized the way lawyers market their practice. It has also created confusion, misperception and unrealistic expectations. Nolo reduces that confusion by providing our lawyers complete insight into how their online marketing efforts translate into clients -- in real-time. Through our powerful performance dashboard, our lawyers have instant tracking and insight into how consumers interact with them though our network. 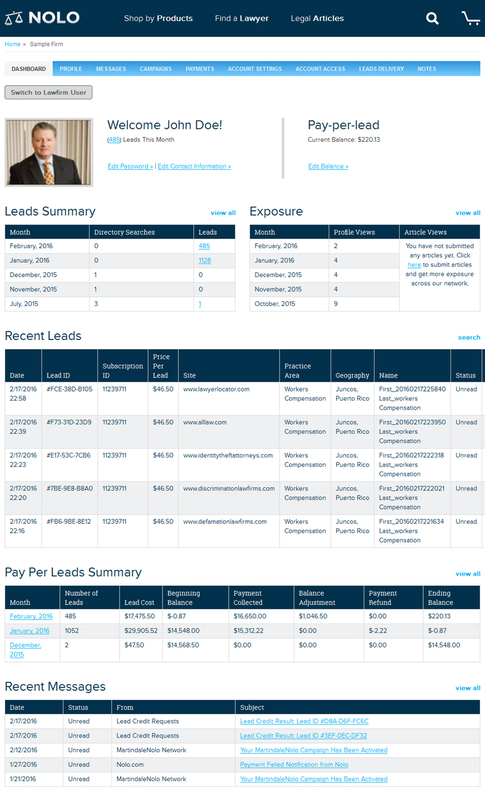 Your dashboard gives you quick insight into how well your marketing dollars and your time investment is paying off. Find out how many people visit and read your content, how many read your law firm profile, and most importantly, how many leads your campaign spend generated. With this data, you can make informed decisions on how to adjust your campaign to maximize the efficacy of your lead generation efforts. It's law firm marketing made easy.